Founded in 1932 in Sydney, Australia, Breville is a small kitchen appliances maker. The company became a popular household name when they created the original sandwich toaster back in 1974. It was such a big hit that for a long time, Breville became the generic term for a sandwich toaster. Since then, Breville has traded in over 30 countries worldwide. They also launched other product lines that include grills, kettles, microwaves, juicers, deep fryers, blenders, food processors and yes, espresso machines. 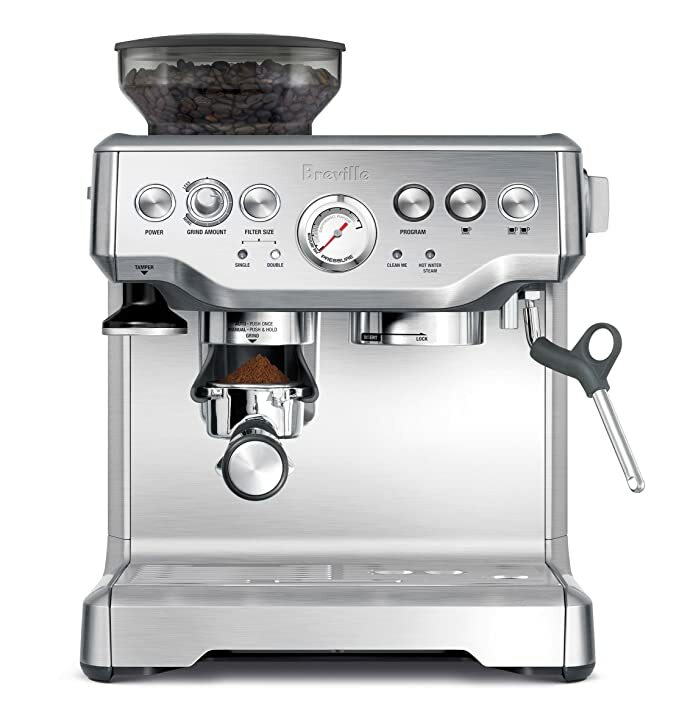 The Breville BES870XL Barista Express Espresso Machine is just one of the many superb products Breville has to offer. And what a product it is! Once you get the machine, you’ll find that unboxing is quite easy. Everything is actually packed well. And it’s not very difficult to take anything apart or put them together. The user manual that comes with the package is written in such a way that it’s easy to follow. You’ll be pleased to find that the Barista Express is built very well, too. There are no cheap plastics. It comes in three colors- stainless steel, cranberry red and black sesame. For the purposes of this review, we went with the stainless one. It’s the one that looks best on our kitchen counter. If you’re a total newbie at making espressos however, you might find that it can take you a few tries to get the machine to produce a cup to your specific liking. Make no mistake, the machine is easy to use. All the parts are easily accessible. We needed to put water in from under the countertop and all we needed to do was pull the machine out. Actually, we could’ve turned the machine sideways and we’d still be good. However, it did take us more than a few days to properly gauge what pressure will produce the best espresso. And while a burr grinder that’s built in is a welcome touch, we also had some trouble getting the right amount in to prevent spilling over. Many coffee machines do not come with burr grinders. You’d have to buy those separately, or have your coffee beans ground at the shop where you bought it. Of course, you’d find that nothing beats the flavor of freshly ground beans. That’s what makes the Breville Barista Express so good. The burr grinder directly feeds the grounds into the container where you make the espresso in. It doesn’t change the fact though, that even with the most minimal coffee beans to grind, the automatic grinder settings kept resulting in a slight overflow. So yes, you can adjust a whole lot of stuff on this machine – grind fineness, ground amount, how hard you tamp the grounds, water amount, water temperature, manual shot length, etc., it will take some trial and error to get everything going smoothly. For a while, we even had to resort to starting and stopping the grinder manually to control it. Once we got the hang of doing things though, everything was a breeze and we managed to produce cup after perfect cup of coffee. Customer service is also awesome! Many products only offer good support pre-sale. Not Breville. Their technical support line is always staffed with friendly and helpful people that are willing and able to answer every concern. Over-all, the Breville Barista Express Coffee Machine may take a while to learn to use, but once you get the hang of it, it’s a great coffee-making companion. It’s not perfect but it’s good value for your money.